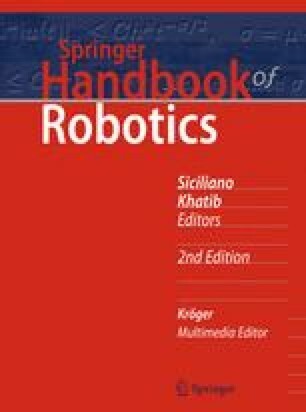 This chapter focuses on the principles that guide the design and construction of robotic systems. The kinematics equations and Jacobian of the robot characterize its range of motion and mechanical advantage, and guide the selection of its size and joint arrangement. The tasks a robot is to perform and the associated precision of its movement determine detailed features such as mechanical structure, transmission, and actuator selection. Here we discuss in detail both the mathematical tools and practical considerations that guide the design of mechanisms and actuation for a robot system. The following sections (Sect. 4.1) discuss characteristics of the mechanisms and actuation that affect the performance of a robot. Sections 4.2–4.6 discuss the basic features of a robot manipulator and their relationship to the mathematical model that is used to characterize its performance. Sections 4.7 and 4.8 focus on the details of the structure and actuation of the robot and how they combine to yield various types of robots. The final Sect. 4.9 relates these design features to various performance metrics.